About Handyworks Property Services, Inc.
Mr. Mike Zelski is the president and founder of HandyWorks Property Services Inc. Born in Amesbury, Massachusetts, Mike grew up in a blue collar environment that included a parochial school education. His early values were also shaped from his lengthy involvement in the local YMCA . From a very early age Mike was exposed to a blue collar education that included learning a variety of trades to help maintain his family's 19th century New England farm house, and also provide him with the skills that would support him while attending school. Following his Honorable Discharge from the United States Air Force, Mike earned a Bachelor of Science Degree in Business Management from California Polytechnic University in Pomona California. It was in the Air Force that Mike met his wife Karen and, both of their children were born in California while Mike and Karen were pursuing their education. Mike spent the next 25 years in marketing and customer service, but never lost his passion for honing the trades that he learned in his early years. During the following years Mike and his wife had bought and renovated several "project" homes, performing most, if not all the trades required in the renovations. 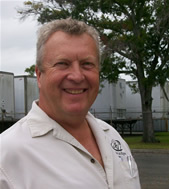 In the late 1990's Mike was presented with the opportunity to help a friend build his commercial contracting business. Mike was initially responsible for securing new projects but he quickly found himself managing many of those projects as well. That chance opportunity ignited Mike's passion to pursue his State Contractors License and establish a business built on the values that he had developed at an early age and, that had served him throughout his professional career - honesty and integrity. Mike Zelski founded HandyWorks Property Services, Inc. in 2002 and within a few years the annual gross sales were exceeding the $1,000,000.00 mark. The company was built on Mike's firm belief that INTEGRITY is the company's number one responsibility and that it is best accomplished through "Res Non Verba" - "Deeds, not Words." With Mike's extensive customer service background, he is focused on providing top quality service to all of his clients. HandyWorks has built its business by developing a loyal customer base, and through a strong referral network.